Full text of the 37-page speaking indictment reads like a spy novel, with Americans cast as the "useful idiots". The indictment is unimpeachable. What about Donald's impeachability, incapable as he is of responding to Putin's and the Russians's attack on American democracy, maybe b/c Donald too has become their useful fool? The Special Counsel's investigation is ongoing. There will be no comments from the Special Counsel at this time. 1. We might get you for abetting the crimes of the Russian baker's dozen, even if what you did to help them was perfectly legal. 2. Failing that, we might be able to get you for obstructing our investigation of what those 13 Russians were up to. Last edited by jserraglio on Sat Feb 17, 2018 6:20 am, edited 1 time in total. Henry Kerner(TBD) Confirmed by the 115th United States Senate (voice vote) on October 16, 2017. He graduated from Harvard Law School and spent 18 years working as a career prosecutor in California. In 2011, he joined the staff of the House Committee on Oversight and Government Reform, the chief investigative committee of the United States House of Representatives. Under Chairman Darrell Issa, and later, Chairman Jason Chaffetz, he led investigations of the federal bureaucracy and fought on behalf of whistleblowers to protect American taxpayers. Mr. Kerner was also the staff director under Ranking Member Sen. John McCain of the Senate Permanent Subcommittee on Investigations, the lead investigative committee of the Senate. He left the Hill in early 2016 and joined Cause of Action Institute as vice president for investigations. Cause of Action is a nonpartisan oversight group committed to exposing waste, fraud and abuse in the federal government. It has worked with whistleblower and good government groups throughout the country. Please note that, as usual for this office, he is a political appointee. While all the hullaballo is going on over the Trump administration, what's happening in the background? The word smokescreen comes to mind. The 'Baker's Dozen' operated their scam out of a St. Pete troll farm. Their chief is called 'Putin's Cook'. What is known about these rascals? NYT 2/17 — ST. PETERSBURG, Russia — Operating from St. Petersburg, they churned out falsehoods on Facebook, Twitter, Instagram and YouTube. They promoted Donald J. Trump and denigrated Hillary Clinton. They stole the identities of American citizens. They organized political rallies in several states, and hired a Clinton impersonator for one event, in West Palm Beach, Fla.
On Friday, 13 Russians were indicted by a federal grand jury in Washington on fraud and other charges. Details of their roles in a three-year campaign to disrupt American democracy have begun to emerge from the indictment, other records, interviews and press accounts. According to the indictment, he controlled two companies that financed the operations of the Internet Research Agency, a shadowy troll farm. Created in 2013, it began a so-called translator project in 2014 that targeted Americans and pursued “information warfare against the United States.” It employed hundreds of people and, by the summer of 2016, was spending $1.2 million a month. In the past five years, Mr. Prigozhin has received government contracts worth $3.1 billion. Lately, he has branched out into areas like recruiting contract soldiers to fight overseas and establishing a popular online news service that pushes a nationalist viewpoint, making him even more indispensable to Mr. Putin. Mr. Prigozhin, 56, declined several interview requests from The New York Times in recent months. One sign of his connection to the trolls, according to the indictment: In what appeared to be something of an inside joke, people working for the Internet Research Agency paid an American to hold a sign outside the White House — “Happy 55th Birthday, Dear Boss” — to celebrate Mr. Prigozhin’s birthday (June 1) in 2016. Mr. Bystrov is a retired St. Petersburg police colonel who, according to the indictment, joined the company in February 2014 and became its highest-ranking official. He also led shell entities that were used to conceal its activities, including one called Glavset, a so-called database and information company. 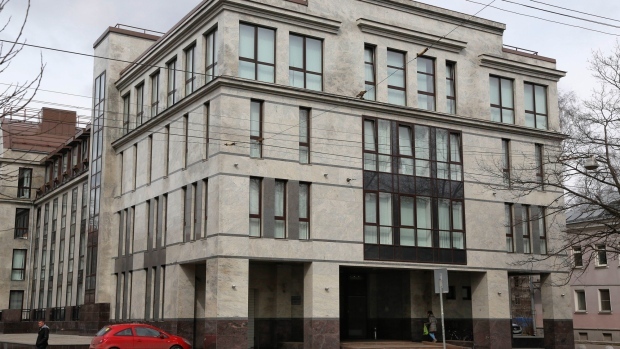 It shared an address — 55 Savushkina Street — with the Internet Research Agency. The troll farm soon drew notice in Russia: news outlets reported that it employed 250 people in 12-hour shifts to provide a round-the-clock flow of pro-Kremlin posts and comments, praising Mr. Putin and excoriating President Barack Obama and President Petro O. Poroshenko of Ukraine. Monthly salaries ranged from $1,100 for a junior analyst to $1,400 for a blogger to $4,200 a month for senior management. Mr. Bystrov, who is believed to be 59, has avoided reporters and declined interview requests. A young tech entrepreneur, Mr. Burchik, 31, joined the company in October 2013 and became its executive director, the No. 2 official, by March 2014, according to the indictment. According to online records, he registered a company in 2009 called Add1.ru that was behind a 2014 hoax. In that hoax, a young woman in aviator sunglasses calling herself Zoe Foreman spent hours spamming politicians and journalists about a horrific — and fictitious — chemical plant explosion in Louisiana. “I have heard of it, but I don’t work in this organization,” he told the journalist Adrian Chen, who wrote about the troll farm in 2015 for The New York Times Magazine. He said he had bought and sold many internet domains and didn’t remember them all. Throughout the troll farm’s operations to interfere in American politics, including the election, “Burchik was a manager involved in operational planning, infrastructure and personnel,” according to the indictment. The business news website RBC reported on Friday that Mr. Burchik claimed not to know English well enough to understand what he had been accused of. “If a few hundred million Americans are so worried about the activities of a regular Russian small-business man from the IT-sphere doing website development, then it seems the situation in the country is completely grave,” he said. Mr. Burchik told Komsomolskaya Pravda, a Russian tabloid, that he was not concerned about being detained while traveling abroad. “I love my country. In Russia there are many beautiful places where you can go,” he said. Ms. Bogacheva and Ms. Krylova obtained visas to visit the United States in 2014 “under false pretenses for the purposes of collecting intelligence to inform the organization’s operatives,” according to the indictment. They are said to have embarked on what amounted to a three-week reconnaissance tour, visiting California, Colorado, Illinois, Louisiana, Michigan, Nevada, New Mexico, New York and Texas. Along the way, they bought SIM cards, cameras and drop phones and discussed “evacuation scenarios” and other security measures. According to the indictment, Ms. Bogacheva oversaw the data analysis group for the “translator project.” A woman with the same name was listed in 2013 on the website of ITMO, a prestigious science university in St. Petersburg, as a doctoral candidate. Many of its graduates have gone on to work for the Russian government or for large tech companies. Ms. Krylova became the No. 3 person at the troll farm, according to the indictment. According to what appears to be her LinkedIn profile, she is a graduate of the Moscow State University of Printing Arts, where she studied with the faculty of advertising and public relations. Mr. Polozov ran the troll farm’s I.T. department and oversaw the purchase of space on computer servers inside the United States to set up virtual private networks that masked the agency’s Russian location, according to the indictment. After a co-conspirator traveled to Atlanta in November 2014, he gave Mr. Polozov a summary of his trip and expenses. According to business records and Mr. Polozov’s page on the Russian social network Vkontakte, Mr. Polozov runs a software company called Morkov, which was registered in 2013, and began to recruit web developers and programmers in early 2014. The greatest possible mistake is to neglect the Russians. Consider them weak. Offend them. Never offend the Russians. The Russians are never as weak as you think they are. God forbid you expel the Russians or take something from them. The Russians always come back. The Russians will come back and take back what is theirs. But when the Russians return, they do not apply force proportionally. They destroy everything in their path. Not much is known about the Bovdas, including their relationship. According to the indictment, she was the head, and he the deputy head, of the “translator project,” the troll farm’s campaign to target Americans with messages on Facebook, Twitter, Instagram and YouTube, starting in April 2014. The project employed hundreds of people and, by the summer of 2016, was spending $1.2 million a month. It hid activities through a web of shell companies. According to the indictment, Ms. Bovda and Mr. Bovda both worked for the troll farm for about a year, from November 2013 to October 2014. According to the indictment, Mr. Aslanov oversaw many of the operations targeting the United States election. An investigation by RBC, a newsmagazine, found that Mr. Aslanov was in charge of the “American department” of the troll farm. It reported that Mr. Aslanov arrived in St. Petersburg in 2000 from his hometown Ust-Kut, in the Irkutsk region. His Vkontakte profile says he graduated from the Russian State Hydrometeorological University in St. Petersburg in 2012, and a university page indicates that he studied economics and wildlife management. The RBC report says that he spent several months in the United States in 2009, visiting New York and Boston. His work at the troll farm included registering legal entities in the names of his employees. His name appears in public records as general director of Azimut — which, according to the indictment, was used to funnel money to the troll farm — and of the Reputation Management Center. According to its website, the Reputation Management Center first determines what kind of reputation a client has online through media monitoring, and then creates bots that improve its image through positive posts, “drowns negative reviews in a sea of favorable information about the company” and “creates hype” around it. Mr. Podkopaev was an analyst for the “translator project.” He conducted research on the United States and drafted social media messages for the organization, according to the indictment. Mr. Vasilchenko posted to, monitored and updated social media accounts while posing as Americans or as American grass-roots organizations. He led two subgroups focused on political interference in the United States, including the election. On Vkontakte, he shared a meme in October 2016 that imagined a drinking game in which players took a shot every time Mr. Trump talked about building a wall along the Mexican-United States border or making America great again, told voters to believe him, or complained about being treated unfairly; and every time Mrs. Clinton coughed, sipped water, laughed awkwardly, or mentioned her daughter or President Barack Obama. Mr. Venkov inhabited multiple social media personas, according to the indictment. Someone with that name belongs to a Facebook group of social media marketing professionals and posted a photo last May of himself wearing a Republican elephant pin. Ivan Nechepurenko reported from St. Petersburg, Russia, and Michael Schwirtz from New York. Reporting was contributed by Oleg Matsnev, Neil MacFarquhar and Sophia Kishkovsky from Moscow; Lincoln Pigman from London; and Jack Begg and Sewell Chan from New York.